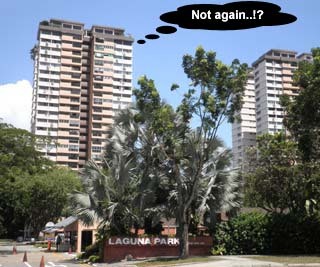 Enbloc News #3: Wassup, Laguna Park? The tender for the collective sale of Laguna Park has closed. Its marketing agent Knight Frank declined to elaborate if any bids were received in the tender, or if the bids matched its reserve price. Knight Frank would only say it is in the process of negotiating with an interested party. The marketing agent has another 10 weeks to finalise a sale or negotiate a private treaty with interested parties, before the en bloc process collapses. Experts speculate that Knight Frank's reluctance to reveal more details could mean a lack of strong interest for the site. This is the second time the 33-year-old condominium has been put up for sale. The asking price this time is $1.33 billion, higher than the $1.2 million price tag in an earlier attempt in October 2009. If the sale goes through this time, Laguna Park residents could pocket about $2.2 million each from the successful sale of the property. In other words: Offer (if there was one) is some way below the reserve price so expect more negotiations (marketing agent vs interested party) and persuasions (marketing agent vs residents) to take place over the coming 10 weeks. 1 comment to ''Enbloc News #3: Wassup, Laguna Park?" Waste of time lar. It takes a year to get 81.7% to agree to the reserve price which is pretty fair and reasonable compared to other enbloc projects. What makes this "interested party" think that 80% of the owners will sign within 10 weeks to agree on the lower price. It is a matter of pride. The "interested party" is obviously insincere by offering a price lower than the reserve price. Dun waste time. Ask them to go buy GLS sites. GLS: Lower tender bids expected? SG PropTalk is now on Ovi! Thomson Grand starts preview today! What if Godot really appears?